Corporate communication plays an important role in higher-level management to help build and preserve a company’s reputation. This intangible yet valuable asset determines the net worth of a company and affects the success of its operations. 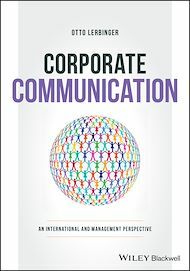 Corporate Communication: An International and Management Perspective introduces readers to the broad environment of the modern extended organization and provides an understanding of the globalization process. It describes how economic, political, and cultural features of a country affect company decisions and communication and discusses various communication disciplines and practices that are employed in programs and campaigns. This book addresses the key management issues of sustainability and technology and innovation. It also emphasizes the importance of why corporate communication must be seen as a management function and not restricted to a communication process. Corporate Communication is intended for upper-level undergraduate and graduate students in schools of communication and schools of business and management who want to extend their competence to the global arena and to combine the various communication practices to design strategic programs and campaigns. Course titles include corporate communication, international public relations, corporate public affairs, global marketing communication, global corporate communication, and social media.